Utilizing open space and some compelling imagery that was originally created for a 2018 exhibit, Pat Rogan of Washington, D.C.-based creative studio Assemble and ESLC staff recently installed some conservation-charged decor to the Eastern Shore Conservation Center. ESLC originally had the exhibit pieces created as a part of Shore Explorations, a month-long studio where participants strolled through Easton’s Waterfowl Building exploring the Shore’s history, ecosystem, and culture to seek a better understanding of their past, present, and future on the Mid-Shore. “It is always a thrill to work with experts to try to illustrate a grand vision that helps others imagine what is possible,” says Rogan. 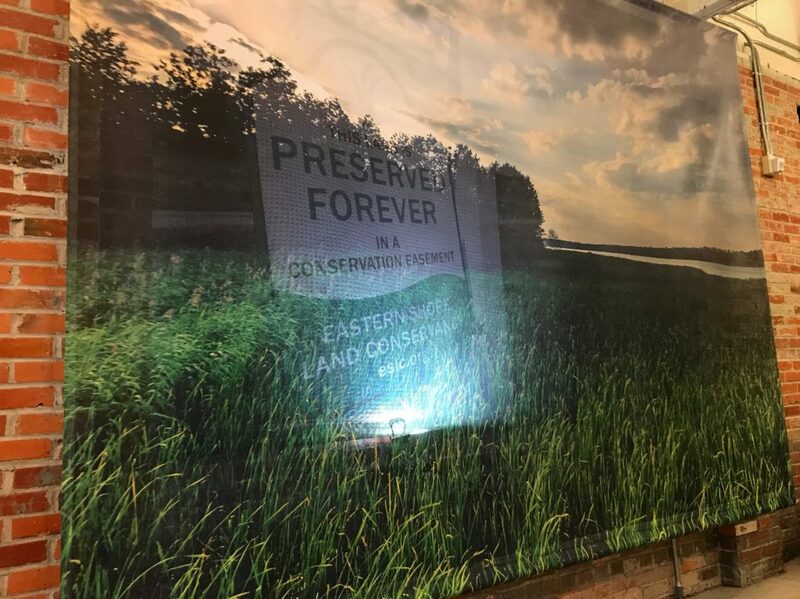 The installation includes two separate graphics – one of ESLC’s ‘preserved forever’ signage that accompanies our land easement properties, layered over by another vinyl mesh graphic of a picturesque Eastern Shore setting. An LED light is placed in between the graphics to make the signage somewhat magically appear through the scenery. Once an abandoned eyesore on a main downtown Easton thoroughfare, the Eastern Shore Conservation Center was rehabilitated by ESLC into a LEED-certified, mixed-use campus housing a suite of nonprofit partners, local businesses, and apartments. The building was purposely designed with space to accommodate members from our community – large and small conference rooms, kitchen area, and outside courtyard all provide an uniquely urban and resourceful backdrop for any group or class needing space to host a meeting, party, or conference. For more information on renting space, please contact ESLC Facilities & Administrative Manager Owen Bailey at 410.690.4603.